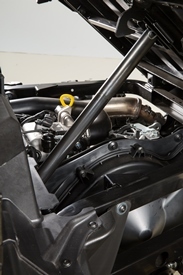 To complement the comfortable operation station, the XUV560 and XUV590 Series are equipped with four-wheel independent suspension. 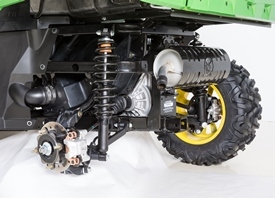 This unique suspension set-up provides an unparalleled ride over challenging terrain and excellent handling through corners. 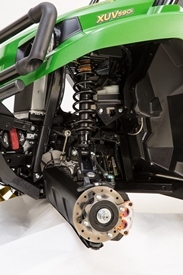 The engineering team, in collaboration with engineering firms that consult with Formula 1®, NASCAR®, and INDYCAR® teams, built a capable suspension system for class-leading operator comfort no matter what the terrain. NASCAR is a trademark of NASCAR. INDYCAR is a trademark of Brickyard Trademarks Incorporated. Formula 1 is a trademark of Formula One Licensing BV, a Formula One Group Company. Best-in-class sealed storage volume of 34 L (9 gal.) 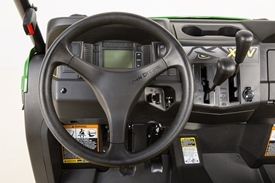 with a large in-dash glove box and under hood storage. An additional 34 L (9 gal.) 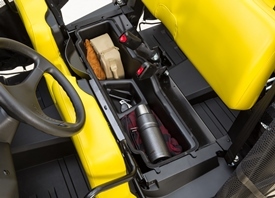 of under-seat storage is available on the S4 models. Start in gear or neutral position for quick starting. The service brake must be engaged to start. 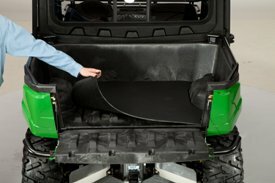 The cargo box consists of a high-density polyethylene copolymer composite material that eliminates rust, dents, and reduces noise. This large, one-piece design has rounded inside corners to ensure material removal when tilted. 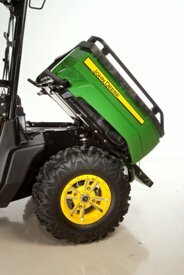 The composite box is highly ribbed and supported with a welded, steel-ladder structure to ensure hard-driving performance and longevity. 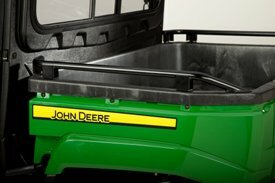 The three highly-styled exterior pieces are made of TPO for extra durability. 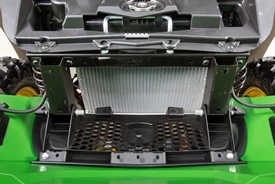 The tailgate’s pivot point is made of hardened steel for durability and designed for tool-free removal. 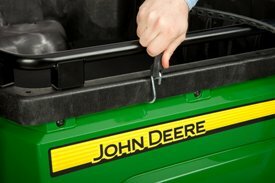 The standard lanyards can also be disconnected without tools to remove the tailgate for convenient loading and unloading tasks. 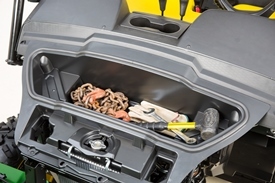 The cargo box ease of use is critical to performing tasks quickly and efficiently. 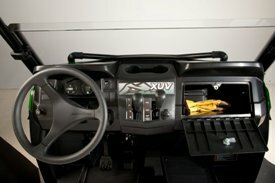 Starting with the truck-style tailgate, the removal of content in this cargo box could not be easier. 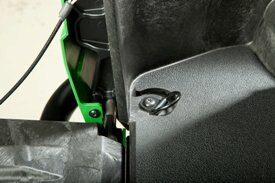 The manual release also functions as the lift lever, done in a smooth, one-step motion. It can even be tilted from both sides of the vehicle. 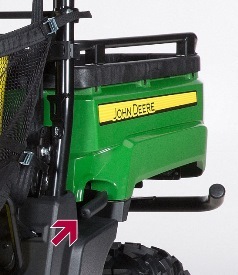 To reduce the overall effort of lift, the pivot point of the cargo box is closer to the center. 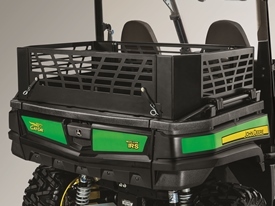 The combination of easy-to-use attributes makes this cargo box best-in-class. 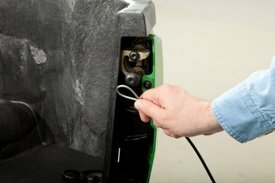 For servicing the vehicle’s systems, the cargo box is easily removable. 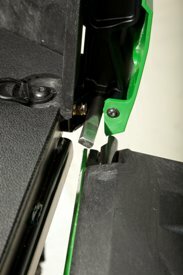 With the removal of two bolts, the cargo box can easily be detached from the vehicle frame. 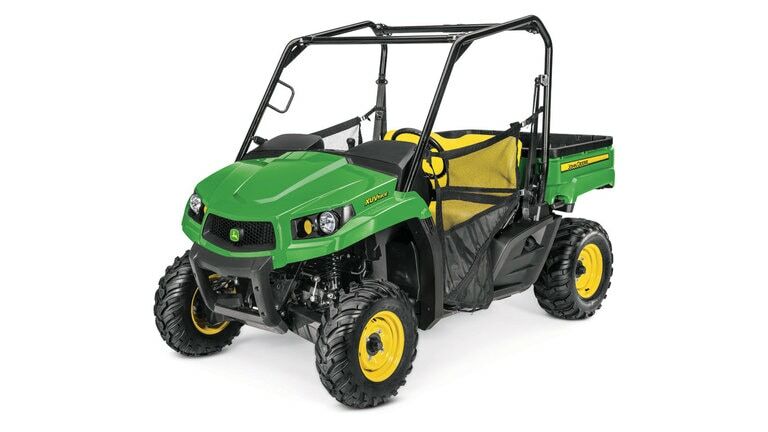 The Gator™ XUV590E and XUV590M Crossover Series Utility Vehicle is powered by a 586-cc (35.8-cu in. 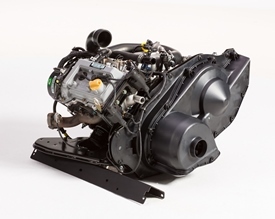 ), inline twin-cylinder, electronic fuel-injected (EFI) gasoline engine. 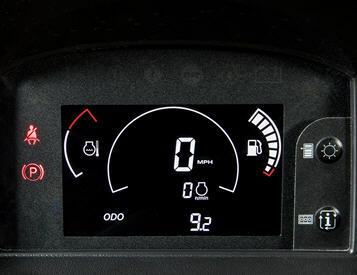 The engine is electronically controlled through an engine control unit (ECU) to ensure optimal engine performance.